Au Courant Collar Necklaces Add a Stylish Touch! Stylish Collar Necklaces Add That Finishing Touch! 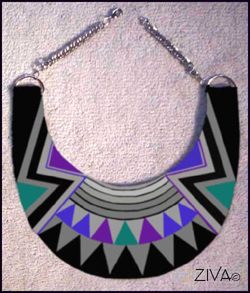 These voguish collar necklaces’ designs will add a striking touch to whatever you’re wearing! Whether you wear them with your Little Black Dress or something more casual chic and colourful, they will give an exclusive look! These elegant designs have been designed for 18 gauge canvas and will be available ONLY in CHART FORM. 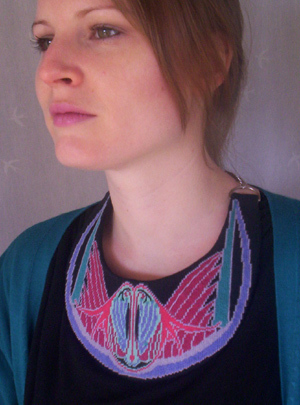 By adding this ‘Rose Feathers’ necklace to a simple black dress, you will create a distinctive and individual ensemble! 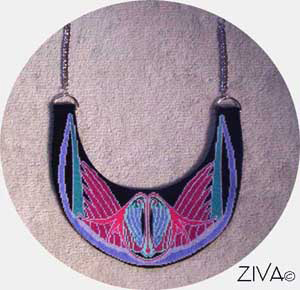 It’s been adapted from an original Art Nouveau design, with a central motif of mauve feathers, encircled by two curving fuchsia flowers, and flanked by arching rose-pink feathers. This design motif creates a very sophisticated and elegant effect! We’ve stitched it with a yarn mix of 50 % silk and 50% wool – providing a wonderful combination of the soft lustre of silk with the strength of wool. Stitched on canvas gauge of 18 holes per inch, this fine yarn gives the perfect finish. For a making-up idea to consider, we've added two ‘D’ rings with a simple chain to allow you to adjust the length of the necklace to suit the neckline of your dress or top. Our model has added it to a black T-shirt and a turquoise sweater for a bit of casual chic! I love the way the form of the necklace appears to change when worn on a black top! THE DYNAMIC ‘DORN DECO’ DUO! Inspired by the magnificent carpets designed by Marion Dorn for Claridges Hotel in London in the 1930’s, we have created two necklaces in the ART DECO style. The necklace at left worn by our model, called Dorn Deco Neutrals, is a striking design in a range of greys accented with black to create a show-stopping accent to her Little Black Dress. Striking classic ART DECO range of greys and black to beautifully accessorize your LBD! This same design is equally dramatic by adding three accent colours- blue purple, red-purple and turquoise-green. What accent colours would work with your wardrobe to create this dynamic effect? This flowing motif, influenced by Art Nouveau’s sinuous lines, works beautifully within the curved shape of the necklace creating a romantic delicate design. 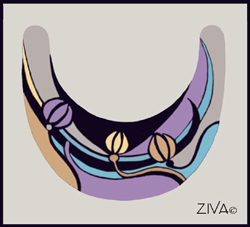 I’ve adapted this necklace design including its colours from the Iris Buds clutch bag and the Dutch iris handbag design. An exotic display of floating multicolour Japanese parasols on a black background to tempt you! Each parasol motif has a different, intricate array of flowers and leaves. Stitch it in silk to enhance its oriental flavour! 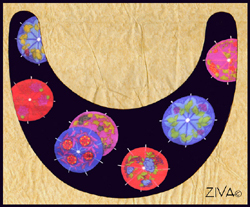 COLLAR NECKLACE CHARTS ARE NOW AVAILABLE! 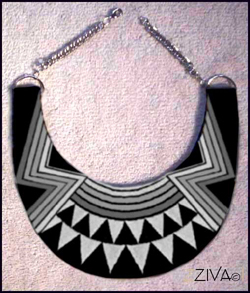 Go Shopping for these unique necklaces designs.